Mr. Bhona is always looking for the easy way to become a tycoon no matter the legal or moral questionability of its nature. When his long-suffering wife Pretty gets sick, he uses her illness to make an appeal to upstanding Mr. Slu who owns a magic ring. Slu, who lives in a modest house and has his Jaguar constantly in the shop, insists that his ring is not for material rewards but to "sort things out that need to be sorted." For Slu, who was once helped by Pretty in the past, an illness that no healers can treat is just that. However suspicious he is of Bhona's motives, he lends him the ring in hope that curing Pretty's illness will be the start of Bhona becoming an honest and upstanding citizen. Bhona takes the ring and uses it to gain access to a bank and steal a bag of money. Although he is slightly perturbed when a guard comes and the ring actually allows him to wish the man into thin air; but he returns home to Pretty – who is sick but not dying – with plans to get a new house, car, and servants. When he boasts that with the ring, he will make Pretty the "prettiest Pretty" and she turns into an entirely different person, he is not sure whether he has had a nightmare or was able to undo the wish with the ring. Bhona returns the ring to Slu, who is unaware of its misuse, and uses the money to buy a zinc house for himself and Pretty who he fools into believing that he has gone into business with international merchants. When he goes broke from his extravagances, he promises a gang of thieves the same kind of lifestyle he pretends to have if they will rob Slu's house and bring his belongings back to him; however, the ring may have decided for itself that Bhona and his band of thieves are something that needs to be sorted out. Knowing little-to-nothing about Apartheid-era African cinema – the few South African films that were widely exported being films with co-production money from other countries like The Gods Must Be Crazy or the dire quasi-supernatural slasher The Demon apart from non-African films lensed in South Africa in the eighties and nineties during the tax break era which were usually set elsewhere and imported Black American and British actors – The Comedians is hard to gauge in terms of its local appeal. The morality tale aspect is understandable, but it is uncertain whether the film's comic appeal is meant to come from the leads and whether the title is simply meant to state the genre or say something about the offscreen personas of the stars (whose recorded IMDb credits include onscreen roles in South African films that do not sound like comedies as well as behind the scenes technical duties). It is difficult to discern whether the actor who plays Bhona is a comedian inexperienced with acting for the camera, or a technician/actor mugging to the camera in a quest for laughs. Although the length of the film is pretty standard at just under ninety minutes, the pacing seriously drags for the type of story, which is also not helped by the point-and-shoot long-take aesthetic and presumably semi-improvised dialogue. It would be very interesting to discover how the film was received theatrically, whether it was a bomb or if African audiences derived a level of entertainment from just seeing something locally-produced in familiar locations with actors who might indeed have some recognition off the screen. Technical aspects are primitive, but only slightly more so than some of the aforementioned exported productions (some of the crew perhaps having come from television news or army documentary backgrounds). Director Japie van der Merwe had been previously credited with special effects in another recently unearthed South African film, the actioner Joe Bullet (written and produced by somehow related Tonie van der Merwe). While its value as entertainment might be dubious, The Comedians is a curio worthy of assessment within the range of genres that encompass Apartheid cinema (and possibly one of its few comedies that still survives in restorable form). Restored in HD by Gravel Road Entertainment - the same company that restored Joe Bullet (available stateside from The Film Detective on an MOD-DVD-r and in the UK as an all-region Blu-ray from 88 Films) - the company seems to have done the best it can with the original grainy photography (either slightly over-exposed in the day exteriors or faded), intermittent print damage (and some in-camera scratches), and its harsh shadows and a print source in which shadows cannot help but crush while VOD-focused label Indiepix has maximized the bitrate of the encode on this MOD DVD-R. The 1.33:1 image is pillarboxed within a 1.78:1 window, and the neglect to crop away the side mattes for DVD has the fortunate side effect of making the film easily watchable on players that by default stretch 4:3 DVDs to 16:9 fullscreen. The Zulu Dolby Digital 2.0 mono track boasts clear dialogue in a mix in which virtualy all of the sound effects are on-set apart from the magic ring buzz while the library music never interferes with the volume of the dialogue. The English subtitles are hard-encoded into the image. The only extra is a new trailer (1:17) created by rights holder Gravel Road. 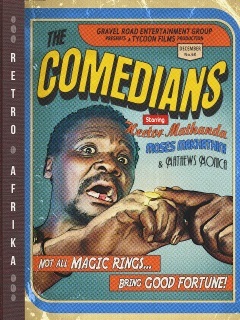 While its value as entertainment might be dubious, The Comedians is a curio worthy of assessment within the range of genres that encompass Apartheid cinema (and possibly one of its few comedies that still survives in restorable form).